MacFamilyTree 8 gives genealogy a facelift: modern, interactive, convenient and fast. Explore your family tree and your family history in a way generations of chroniclers before you would have loved. MacFamilyTree helps you capture your family history, and turns data and facts into conclusive reports and visually impressive charts. 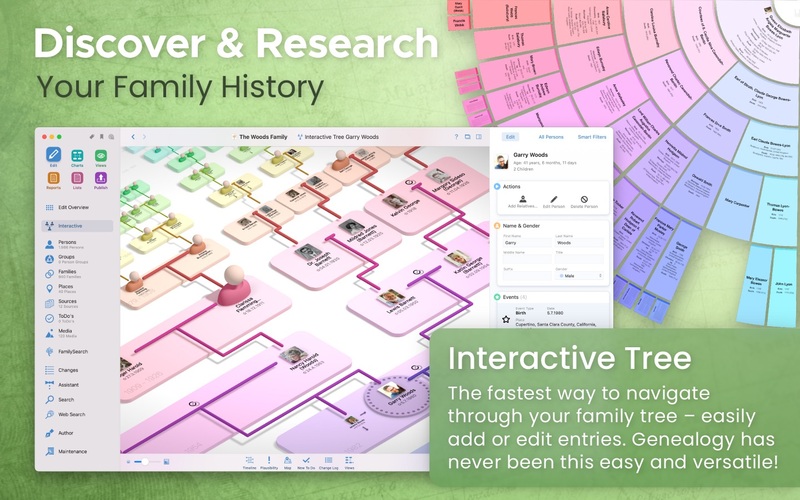 MacFamilyTree 8 offers numerous options for you to capture and visualize your family history. Now matter how you want to illustrate your family relationships – MacFamilyTree 8 has the right solution for you, offering different types of reports, charts or the innovative Virtual Tree 3D view. The possibilities are nearly endless – optionally synchronize your data via iCloud, access a huge genealogical online archive to assist your research, create websites and family books or do your research on the go with MobileFamilyTree 8, available separately for iPhone, iPad, and iPod touch. FamilySearch: Doing extensive research has never been more convenient – access the world’s biggest genealogical archive with several billions of person and family records from the comfort your home. Heredis 5.4.0 – Comprehensive geneology solution.